Rook is the common name for members of the Old World bird species Corvus frugilegus of the crow family (Corvidae), characterized by black feathers (often with a glossy blue or bluish-purple sheen), dense and silky feathers on the head and neck, black legs and feet, and a bare gray-white skin around the base of the bill in front of the eyes. The rook is widely distributed in Europe and Asia. Similar in appearance to the crow and raven of the same genus, the rook nests in colonies, usually near the tops of trees. Highly social and considered quite intelligent, the rook adds to the wonder of nature, particularly with their feeding in flocks, colonial breeding, and communally roosting. And like many other members of the Corvidae family and Corvus genus, the rook features prominently in folklore. Traditionally, rooks are said to be able to forecast weather and to sense the approach of death. If a rookery—the colonial nesting area of rooks—were abandoned, it was said to bring bad fortune for the family that owned the land. Another folk-tale holds that rooks are responsible for escorting the souls of the virtuous dead to heaven (EZ 2006). Like other members of the Corvidae family (jays, magpies, treepies and nutcrackers), members of the Corvus genus are characterized by strong feet and bills, feathered, rounded nostrils, strong tails and wings, rictal bristles, and a single molt each year (most passerines molt twice). The genus Corvus, including the crows, ravens, rooks, and jackdaws (two species, C. dauricus and C. monedula), makes up over a third of the entire family. The rook received its scientific name, Corvus frugilegus, from Linnaeus in 1758. The species name frugilegus is Latin for "food-gathering." The adult rook ranges in size from about 45 to 47 centimeters (17.7 to 18.5 inches), making it similar in size or slightly smaller than the carrion crow. It ranges in weight from about 337 to 531 grams (11.8 to 18.58 ounces) (Grzimek et al. 2004). Like typically for the crow and raven, the rook is characterized by an entire black plumage. Often the rook's plumage is highly glossed and with a metallic blue, purple, or green sheen in bright sunlight (Grzimek et al. 2004). The feathers on the head, neck and shoulders are particularly dense and silky. The legs and feet also are black. The base of the adult's bill, loral region, and chin are bare (Grzimek et al. 2004). The bill of the adult is gray-black, tending to be whitish at the base and shading to gray-black or dusky over the terminal half (Grzimek et al. 2004). 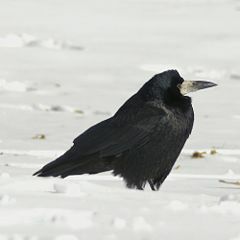 Rooks are distinguished from similar members of the crow family by the bare gray-white skin around the base of the adult's bill in front of the eyes. The feathering around the legs also looks shaggier and laxer than the congeneric carrion crow. The juvenile rook is superficially more similar to the crow because it lacks the bare patch at the base of the bill, but it loses the facial feathers after about six months. 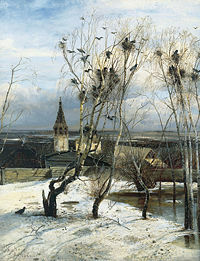 In The Rooks Have Returned (1871), a well-known painting by Alexei Savrasov, the arrival of the rooks represents an early portent of the coming spring. The rook is widely distributed in Europe and Asia, with the exception of the most mountainous areas (Grzimek et al. 2004). Common habitats are wooded steppes and farmland with scattered trees (Grzimek et al. 2004). The rook has a large global population, with some 20 million to 35 million individuals in Europe alone (Birdlife International 2004). 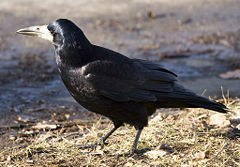 In Europe, the rook is in Great Britain and much of north and central Europe, including northern Scandinavia, and is vagrant to Iceland. In Asia, it differs in being very slightly smaller on average, and having a somewhat more fully feathered face. The range of the rook extends as far as Ireland, Finland, Russia, China, Mongolia, Republic of Korea, Syria, and Egypt, being in about fifty nations of Europe and Asia (Birdlife International 2004). The species has been introduced to New Zealand, with several hundred birds being released there from 1862-1874, though today their range is very localized (Heather and Robertson 2005). In New Zealand, the species is an agricultural pest and it is being eradicated. In the north of its range, Corvus frugilegus has a tendency to move south during autumn, though more southern populations are apt to range sporadically also. There are significant migrations from northern Europe and Asia to western Europe, the Middle East, and southern Asia (Grzimek et al. 2004). In the French district of Seine-et-Marne, the winter population was estimated at 500,000 birds versus the spring population estimated at only 10,000 birds (Grzimek et al. 2004). Rooks feed on the ground, predominately feeding on earthworms and insect larvae, which the bird finds by probing the soil with its strong bill. It also eats cultivated cereal grain, smaller amounts of fruit, acorns, small mammals such as voles, and the eggs of ground-nesting birds. In urban sites, human food scraps are taken from rubbish dumps and streets, usually in the early hours when it is relatively quiet. It has also been seen along the seashore, feeding on insects, crustaceans, and suitable food flotsam. Nesting is always colonial; thus, the term rookery, which applied generally to a colony of breeding animals (sea lion, turtle, penguin, etc.). The colonies typically are in the very tops of trees. Typically there are 20 or more nests clustered together among several trees (Grzimek et al. 2004). Branches and twigs are broken off trees (very rarely picked up off the ground), though as many are likely to be stolen from nearby nests as are collected from trees. Nests are utilized repeatedly in successive years (Grzimek et al. 2004). Eggs are usually three to five in number, and can appear by the end of February or early March. They are incubated for 16 to 18 days. Both adults feed the young, which are fledged by the 32nd or 33rd day. The voice, though similar to that of the carrion crow, is usually described as a "kaah-kaah-kaah," while the bird fans its tail and bows on each caw. Solitary birds often "sing" apparently to themselves, uttering strange clicks, wheezes, and almost human sounding notes. Birdlife International (J. Ekstrom and S. Butchart, accessors). 2004. Corvus frugilegus 2007 IUCN Red List of Threatened Species. Retrieved July 13, 2008. Cramp, S. 1994. Crows to Finches. Volume VIII in S. Cramp, D. J. Brooks, and E. Dunn, Handbook of the Birds of Europe, the Middle East and North Africa: The birds of the western Palearctic. Oxford: Oxford University Press. ISBN 0198546793. Debout, G. 2003. Le carbeau freux (Corvus frugilegus) nicheur en Normandie: Recensement 1999 & 2000. Cormoran 13: 115-121.
eZine (EZ). 2006. Magpies, ravens, crows, rooks eZine April 26, 2006 (Issue #996). Retrieved July 12, 2008. Heather, B. D., and H. A. Robertson. 1997. The Field Guide to the Birds of New Zealand. Oxford: Oxford University Press. ISBN 0198501463. Madge, Steve, and Hilary Burn. 1994. Crows and jays: a guide to the crows, jays and magpies of the world. London: A & C Black. ISBN 0713639997. Patterson, I. J., G. M. Dunnet, and R. A. Fordham. 1971. Ecological studies of the rook, Corvus frugilegus L., in North-East Scotland. Dispersion Journal of Applied Ecology 8(3): 815-833. This page was last modified on 19 July 2015, at 19:11.